The Biolite Base Camp Stove has been around for a little while now. What’s unique about itis that it’s a self-contained wood-fire cooking unit, where you can simple use fallen branches or small pieces of firewood to cook you meals – so it’s very efficient and uses a sustainable source for your cooking needs. An internal fan forces air back into the burn chamber dramatically improving combustion and creating a cleaner, more efficient burn. But that’s not all – the extra added benefit of the Biolite BaseCamp Stove is that it converts heat generated when cooking into electricity, so you can charge anything via a USB port, such as smartphones, tablets or any other device that works via USB, generating 5 watts of power. Biolite originally distributed a similar version of this stove in India, where cooking fuel is more scarce and to reduce pollution inside and out of the home. Built with a side load side fuel entry, and a nice grill top that can fit up to 8 hamburgers simultaneously. You have two options for cooking, by using a lever to allow for the flame to flow directly out for boiling water, making coffee, etc., or you can block the direct fire flow which disperses the flame for grilling. The Biolite Base Camp Stove also had a light attached for cooking those late night snacks. This video is a review of the Biolite Base Camp Stove in action. In this video HKPSG1Shooter shows a few other camping gadgets, but the focus is on the Biolite Base Camp Stove. This is his first time trying it out, cooking a steak and a couple hotdogs. After a short while, the units fan blower will kick in automatically and the LED lights will show the power indicator and fire temperature. The tap light can be used once the unit is hot enough. The tap light also has a piggyback USB port for charging your devices. He actually shows his phone charging up. While the cost of the Biolite Base Camp Stove is much higher than your regular inexpensive stoves, you’re only using sticks and twigs, not propane or charcoal so over time it will pay for itself. What’s the Best Backpacking Backpack? Twelve Days of Backpacking Christmas: Top Stocking Stuffers Every Backpacker Will Love. 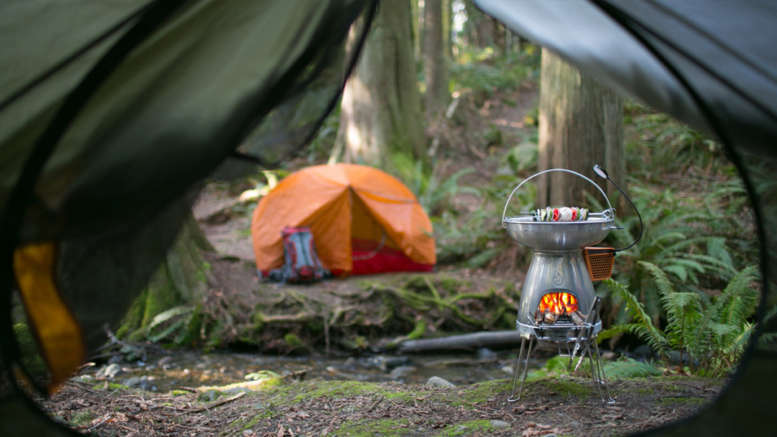 Be the first to comment on "Biolite Base Camp Stove"